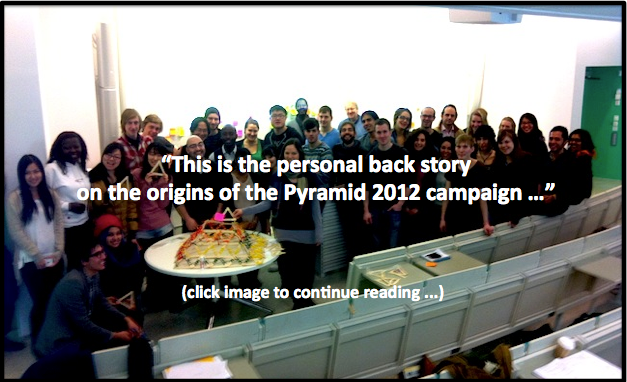 This is the personal “back story” on the origins of the Pyramid 2012 campaign, which published its final report on 18 June 2012. For the official story of this two-month-long “global workshop,” in which well over a thousand people participated, spread across twenty countries, please visit the campaign website to read the press release, 14-page final report, and the individual workshop reports that were sent in from around the world. Fifteen years ago I raced out of a seminar room near the shore of Lake Balaton, in Hungary. I needed to think. I needed to sit very still, alone, by the lake’s edge, and ponder this vision that had popped into my brain. Was I really going to do this? Was I serious? I really was. I went home and reorganized my life to make the realization of that vision possible. Resigned from my job. Simplified my life. And began planning a global art project for sustainability. A few delays and complications popped up, which kept me in that job, but I was exceedingly determined. One year later, I was finally on a sabbatical year, which involved traveling around the world and visiting sustainability initiatives, most of them in cities. I had saved funds to support myself for the year, so I offered free workshops to the sustainability groups I visited, on indicators and change strategy. I played benefit concerts. While traveling, I was also planning my global art project for sustainability. I studied a number of similar global art projects — and noticed that most of them had a difficult time getting financed, and making an impact. So I made small change in plan. The vision of the art project was terribly important to me, but its purpose was more important: to generate inspiration and facilitate real change. And there was a very strong possibility that by doing it as an art project, it would not result in much change. So at the end of that sabbatical, I did *not* launch a global art project. 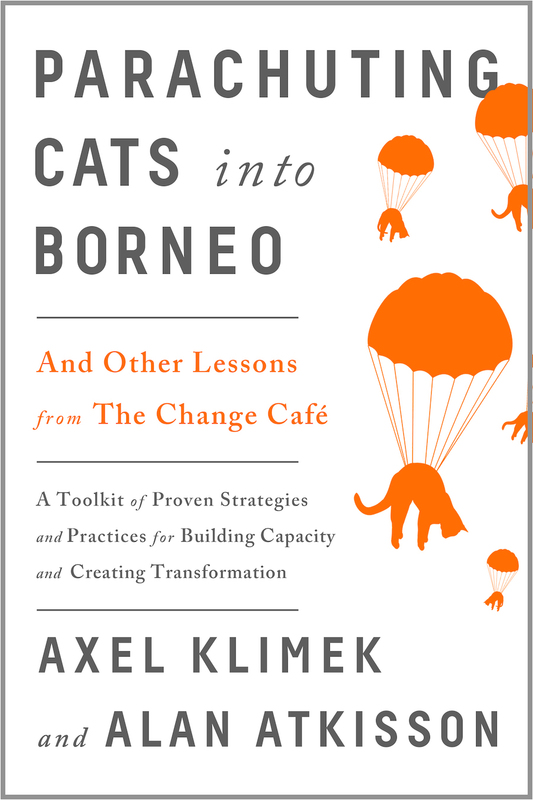 Instead, I wrote a book, and re-invigorated my consultancy. I decided to grow my consulting company … and make *that* my art project. By calling the work I was doing consulting, instead of art, there was a much greater chance that the work would result in concrete changes. Much of the content of the work — dealing with global trends and visions of a positive future — would be the same. But framing it as “consulting” and “training” instead of “art” meant that people would relate to it very differently. To me, it was still my “global art project” … but that was a kind of secret. Now I fast forward, skipping over the serendipitous co-creation of the Pyramid workshop in 2000 (the story is told in my book The Sustainability Transformation), the steady spread of the Pyramid and other Accelerator tools, the expansion of AtKisson Group … and we come to another moment, in the middle of 2008, when the AtKisson Group gathered for a strategy retreat in Barcelona, in connection with the IUCN global congress (I was doing a Pyramid there). In Barcelona, we hatched a plan to try to catalyze hundreds — okay, actually thousands — of Pyramid workshops around the world. The goal was ten thousand, to be exact. We called the idea “10kP,” meaning, 10,000 Pyramids. It sounds a bit crazy now. But we were inspired by Barcelona. And these were also the last months before the 2008 financial meltdown. Anything seemed possible then. Also, my team-members at the time were very enthusiastic — it was one of them, not me, who had formulated the 10kP concept (I tip my hat to Shawn Westcott). They understood this whole “consulting firm as secret art project” idea. So we decided to just go for it, think big, and seek sponsors. In fact, I was on a fundraising trip to the U.S., looking for sponsors for our grandiose 10kP Pyramid plan, when Lehman Brothers crashed. You might say that the collapse of one “pyramid scheme” — the U.S. subprime mortgage market — killed our very different sort of “pyramid scheme”: our plan to get thousands of groups around the world active on sustainability, through Pyramid workshops. As you can imagine, the fundraising visits went very poorly indeed. After the big banking crash made headlines, every funder I met just shook her or his head ruefully. Almost immediately, money for big, global programs became a logical impossibility. After a few days, I stopped asking. And the dream of lots of Pyramids — which was nearly the same dream I had had at Lake Balaton a decade earlier, even though Pyramid was not invented yet — went on ice. Then an email arrived in mid-2011, from Tom Mclean, a teacher at the International School of Manila. Tom had participated in a very short little Pyramid workshop we had offered at a teacher’s conference in Malaysia. That Pyramid had been just a couple of hours long, a “speed” version to introduce teachers to the methodology. Tom was hooked. He was also organizing an international “Global Issues Network” (GIN) conference for 400 high school students. He sent me a two-part invitation: come to Manila to keynote the conference; and help them run 20 parallel Pyramid workshops with the students. Of course I said yes. As it happened, when the conference finally happened in Feb 2012, the students were perfectly capable of running those workshops by themselves. All that I — and Robert Steele, who really deserves a *lot* of the credit for everything that’s happened with Pyramid in recent years — needed to do was watch. The students framed the workshops, trained each other on how to do them, created YouTube video demonstrations, produced policy insights worthy of global negotiators … It was truly wonderful. But something else also happened at the GIN Manila conference. Pyramid 2012 was a scaled down, volunteer-driven version of the older “10kP” idea. Using the 20 student Pyramids as an inspirational springboard, we invited lots of other groups, of all kinds — educational, professional, civic — to do Pyramids of their own. There were no sponsors for Pyramid 2012 (except my little company). Instead, there were just volunteer workshop leaders … using a free “Pyramid Lite” manual … and a low-cost WordPress free website … and a lot of love and goodwill. I hired a wonderful part-time coordinator, Cristina Apetrei, to help spread the word and organize the participants. And then friends, colleagues, strangers … people signed up. During February and March, and into April and May, probably somewhere around a hundred Pyramid workshops happened. We could only document 65, because not everyone manages to go to a website and upload a report or a picture, etc. But we know that well over a thousand people participated, in twenty countries or more, from Moscow to Manila, from Iceland to Zimbabwe. It was so beautiful, wonderful, inspiring to see the reports and photos of all those Pyramid workshops coming in. Students learned. Officials planned. Citizens collaborated. Messages were sent to the Rio+20 summit: we called our final report, “Building the Future We Want,” because we dedicated the Pyramid 2012 campaign to supporting that global summit, by creating local action. And indeed, a number of new action projects were born … and have started to grow. And Pyramid 2012 keeps going. NGO groups in India, teacher trainings in Indonesia, farmers in Colombia … notices of continued activity keep coming in, via email and Facebook and blog comments. Pyramid 2012 has taken on a life of its own. So, that’s the personal story, the dream, behind Pyramid 2012. It took fifteen years for my dream of a “global art project,” involving groups around the world engaging with sustainability trends and visions, to be realized. But the feeling of satisfaction at finally doing it — and seeing other people get engaged, make discoveries, hatch initiatives, and build pyramids — was quite profound. During the process of being realized, the dream of Pyramid 2012 became something much better than I had originally imagined. Because it became a shared dream. I watched with amazement and gratitude as my colleagues and friends, and indeed everyone participating, just grabbed this thing and made it their own. Made it better. Got passionate. Made it work. And wanted it to continue, and to grow. Now, we’re trying to figure out how to make it grow. We don’t yet know how … but we’re dreaming. I will end this narrative with an excerpt from an email I just received (while writing this) from a Pyramid 2012 workshop leader in Colombia, Julia Andrea Osorio Henao. As her words reminded me so beautifully, this campaign, or initiative, or art project — whatever it is! — it is no longer “mine”. It is many people’s, including small farmers in the Colombian countryside, with whom she is using Pyramid, to help them manage their resources more sustainably.